The US State Department has approved the sale of three SEAL Delivery Vehicles to the UK. The three MK 11 Shallow Water Combat Submersibles (SWCS) are to be purchased for an estimated cost of $90 million. The system is a manned submersible, a type of swimmer delivery vehicle, and is currently used by the US to deliver United States Navy SEALs and their equipment for special operations missions. It is also operated by the Special Boat Service, which operates 3 SDV’s which the new systems are replacing. They’re used primarily for covert or clandestine missions to denied access areas (either held by hostile forces or where military activity would draw notice and objection). It is generally deployed from the dry deck shelter on a specially-modified submarine, although it can also be launched from surface ships. The system fits inside the CHALFONT dry deck shelter on the Astute class submarines (pictured above), used to deploy special forces. Image of how the system will look, via HISutton. “The Government of the United Kingdom (UK) has requested to buy three (3) SEAL Delivery Vehicles (SDV) MK 11 Shallow Water Combat Submersibles (SWCS). Also included are spares; handling equipment; test equipment; operator manuals and technical documentation; U.S. Government and contractor engineering, training, technical, and logistical support services; and other related elements of logistics and program support. The total estimated program cost is $90 million. 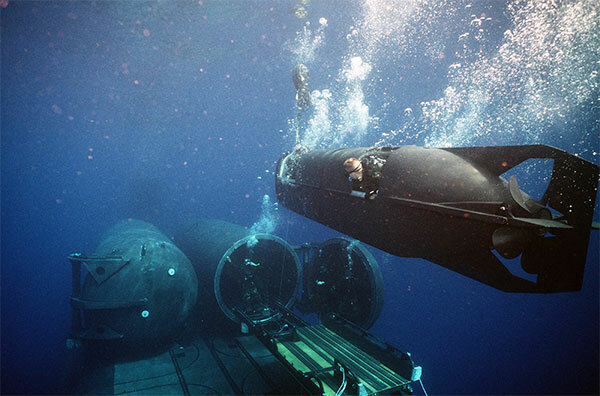 A US Navy SEAL pilots an earlier model MK8 Mod 1 minisub out of a dry dock shelter fitted atop a US Navy submarine. The notice also adds that the prime contractor will be Teledyne Brown Engineering Inc in Alabama. The Shallow Water Combat Submersible (SWCS) is a programme to replace the ageing SDV M.VIII Mod-1 SEAL Delivery Vehicle in use by both the US and UK. The documentation for this is over on Gabriel’s blog. A rare look at what some of the supposed 2 billion uplift in spending on UKSF, highlighted in the 2015 SDSR, is going on. Pictures exist of these SDV being used by the SBS down at Gibraltar, including air delivery by 7 Squadron Chinooks. Maybe they can lay Helions cables while they’re at it. I think the cable laying is a job for the venerable Gosport ferry. Ahhh! At last a proper role! With Mr Reeves at the helm no doubt. ? I remember the days when the navy was that big for some the Gosport Ferry was the only sea time they accrued. I refer of course to the Patel letter and not the spam one. Yes I was reading both!!! I don’t know what conclusion to draw from that rather long winded piece other than the Military Industrial Complex have military and governments by the balls. The Astute class Chalfont shelters were built with the replacement SF submersibles in mind. The USN submarines had to extend their shelters to accommodate the new versions of these underwater vehicles. Some grown up thinking at last. We’d lost the capability when Spartan went I believe. The 41 number is quoted by Gabriele. Is this a new upgrade beyond 1B? Details? Very interested. Thanks. In the good old days we had fleet nuclear powered attack submarines SSNs for surface and subsurface warfare and the SSK fleet of diesel electrics for training crew on periscope course, NATO exercises as the threat vessels and for special forces insertion and operations. Well yes we need 12 SSN’s and a case could be made for 8 SSK’s and further 4 smaller SSk’s for Perisher / Thursday War……… but we are where we are. Sadly. Hang on 7 Astutes, at best 3 on patrol and we need 3 of these?, ridiculous. Surely we can do a share with the Seals and buy one and have an asset share. Crazy what are they Thinking? one on patrol, one on ops, one on refit. These are not Nukes, Just pressure vessels with a battery propulsion system they are not rocket science..more waste. 1 spare in case the deployed one goes wrong. 1 for training at the Chalfont training facility at Faslane or in reserve at Poole. Seems correct number to me. UK doctrine has not deployed an SSN with a CV for nigh on 50 years, they will not do so now for the QE class. RN does not subscribe to US CV BG doctrine. They do not have enough Boats for it. UK SN does not babysit the SSBN force. When a ‘Bomber’ goes to sea only a handful of people know where it is. UK SSNs are used primarily for ASW, with a secondary ASuW and land strike role (the latter of which has been most-used in recent years through force of circumstances). We don’t have the indigenous infrastructure to build the Dreadnought-class and Astute-class at the same time without massively delaying the completion of the SSBN project. SSK’s are great for Defence of a coast line or choke point but it’s a Mission we have never performed even during the Second World War, we are always on the offensive and SSK’s have a limited use in offensive blue water operations. In addition all the roles an SSK can perform will soon be better performed by large UUV’s. We could buy and operate 10 of these for every SSK.